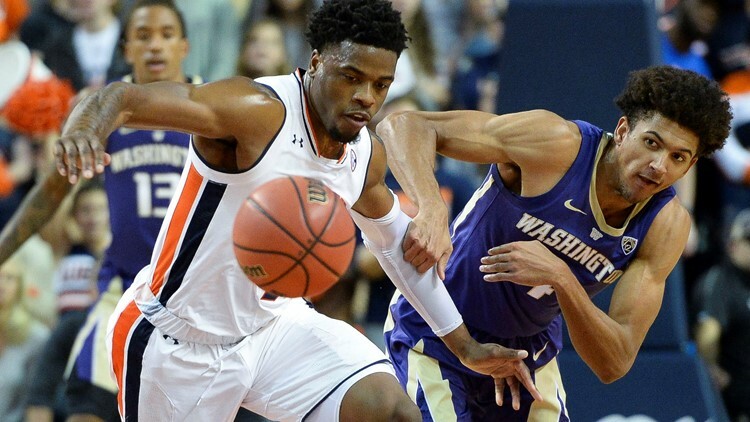 AUBURN, Ala. (AP) - Chuma Okeke had 19 points and 10 rebounds and Samir Doughty scored 18 to lead No. 11 Auburn to an 88-66 victory over No. 25 Washington on Friday night. Jared Harper and Bryce Brown both scored 13 points for the Tigers. Harper also had five assists. Center Austin Wiley saw his first action in more than a season, scoring five points in 13 minutes. Wiley, who was forced to sit out last season as part of a federal probe into corruption in college basketball, missed the opener with a left foot injury. He entered with 16:56 left in the first half to a huge ovation at Auburn Arena.